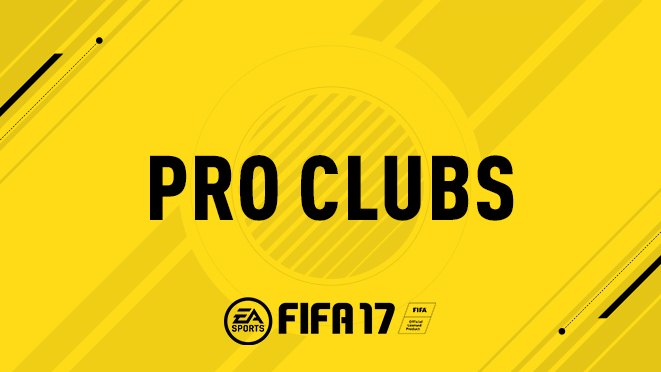 Pro Clubs in FIFA 17 on PC, Xbox One and PlayStation 4 consoles introduces a brand new Player Growth system, based upon fan feedback to help deliver a comprehensive new way to develop your player. In addition, we’ve listened to your feedback and delivered customisable Custom Kits and Crests, which brings a new level of personalisation to your Pro Clubs Season. Player Growth has completely changed in FIFA 17. The new system is based upon your overall Match Rating to really focus on teamwork and co-operation, authentically re-creating real world football where teamwork is the most important aspect. After you have completed a match you’ll receive a Match Rating out of 10. Depending upon which position you play, certain aspects of your Player will level up at different speeds, for example, a striker will grow Shooting more quickly than Defending. 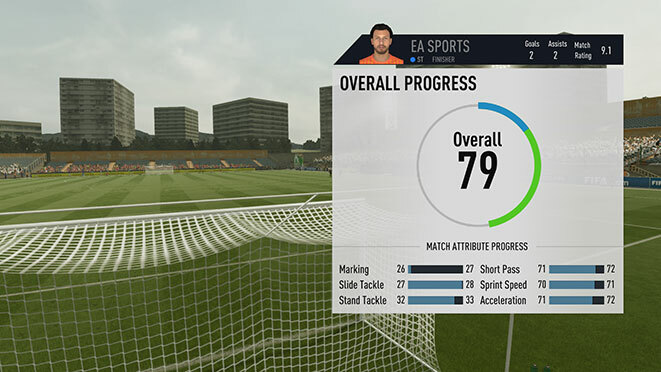 Chart your progress and see how your Player has developed. You’ll be able to track how each of the individual attributes are growing at the end of every match, based upon your match ratings. In addition, you’ll have the option to select from a wider variety of Traits to give a new layer of depth to how your Player grows. 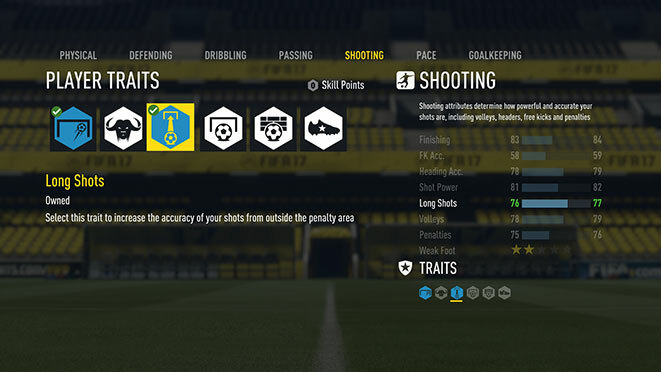 Spend Skill Points, that are earned in-game, to equip specific Traits to Physical, Defending, Dribbling, Passing, Shooting, Pace, or Goalkeeping. 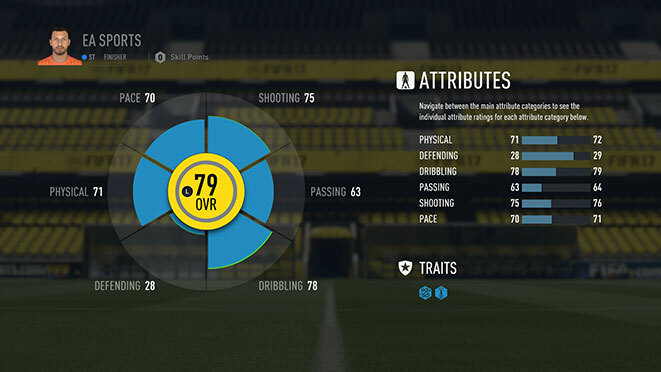 Maybe you want to have a Giant Throw-In Trait or more Pace, it’s up to you to customise your Player. Each Trait comes with a different Skill Point cost, which are earned by playing League or Cup matches, so think wisely before selecting. 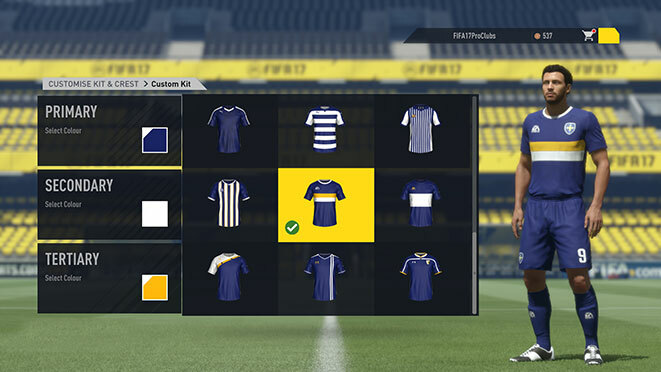 Another exciting feature introduced in FIFA 17 is the opportunity to customise Kits and Crests for your Pro Club. 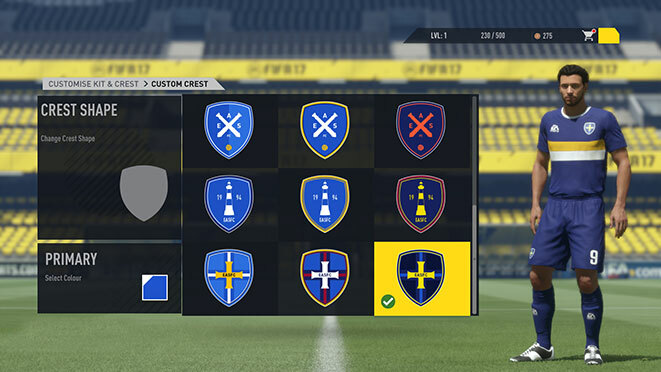 Choose from 24 Kit templates available in FIFA 17 and customise them to match your teams personality. You’ll have the option to select Primary, Secondary, and Tertiary colours to really add a layer of flair to your unique strip. Add that all important Crest to your personal Kit to really feel like a part of the Club. Select your Crest Shape and design before choosing the Primary colour. Now you’ll have a Crest to kiss in celebration of your famous victories.